This morning I had a great and badly needed sleep in. After a few bits of old meat and a tin of sardines for brunch, I went and did ARPANSA a bit later than usual. Following this I went down to the transmitter building and the bands were going off. I had a long chat to a bloke in South Australia and then PowerSDR kept freezing requiring a complete cold restart. It was so unstable, I spent the next 4 hours working on my laptop trying to fix the problem which was so frustrating knowing how good conditions were. I gave it away around seven o'clock and went back to the red shed for some dinner. There was absolutely nothing to eat so I made up some spicy fried rice which tasted great. After dinner I spent more time on my laptop cleaning up the hard drive, defragging the hard drive and running a virus scan. I finally got rid of some of the HP tools that are constantly running in the background hogging all the processor time and now it only takes about one minute and twenty seconds to boot up and the processor is hardly working at all now whereas before it was always running between 60% - 80%, sometimes up to 100% causing everything to slow or freeze. I also removed heaps of programs I never use or I don't want any more. While working on my laptop I was also updating my blog till one thirty in the morning. Thirteenth month on station for the expeditioners of the 66th ANARE crew. A mean maximum temperature of -01.4°C. The average maximum for the month was -01.4°C. The lowest maximum was –07.2°C and the highest 01.7°C. A mean minimum temperature of -07.3°C. The average minimum for the month was -07.4°C. The lowest minimum was -12.9°C and the highest -04.4°C. The coldest temperature for any February day on record at Mawson was -17.3°C on 28/02/1985. The average daily wind run (the measure of how many kilometres of wind pass the station in 24 hours) was 1048 km per day for the month. This is well above the long term average of 947 km per day. 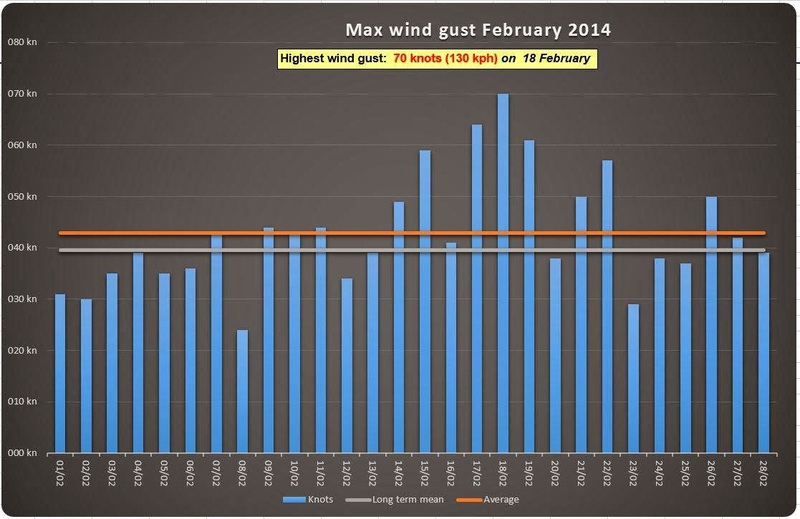 The maximum wind gust for February was 130 km/h from the ESE recorded on the 18th. The record gust for February is 194 km/h recorded on 26/02/1999. There were 24 gales compared to 11.7 expected for the month, 28 days of strong wind, with 26.0 the average. 8 days of snowfall were observed, which is way above than the expected average of 5.0 days. We had 4 days of Blowing Snow (Vis <1km). Note: A Strong Wind day has wind in excess of 41 km/h and a Gale is wind in excess of 63 km/h. We recorded a total of 213.9 hours of sunshine for the month. The long term average is 215.6 hours. February was pretty much in line with the long term mean temperatures but was windier; not in terms of max wind speed but in wind run. Every day of the month we had gale force winds. We experienced an above average number of snow days. How's your laptop now? I hope you don't experience the same inconvenience again, Craig. Situations like these are what makes having a back-up drive advisable. Even though you'll have to reformat your drive, your old files will still be accessible afterward. Good advice. In the mad rush to get ready and organised to come down here I forgot a few things and my budget only stretched so far. I'm still experiencing freezing, but this laptop only has to last me till I get back home, but by the way things are going that could be next year.